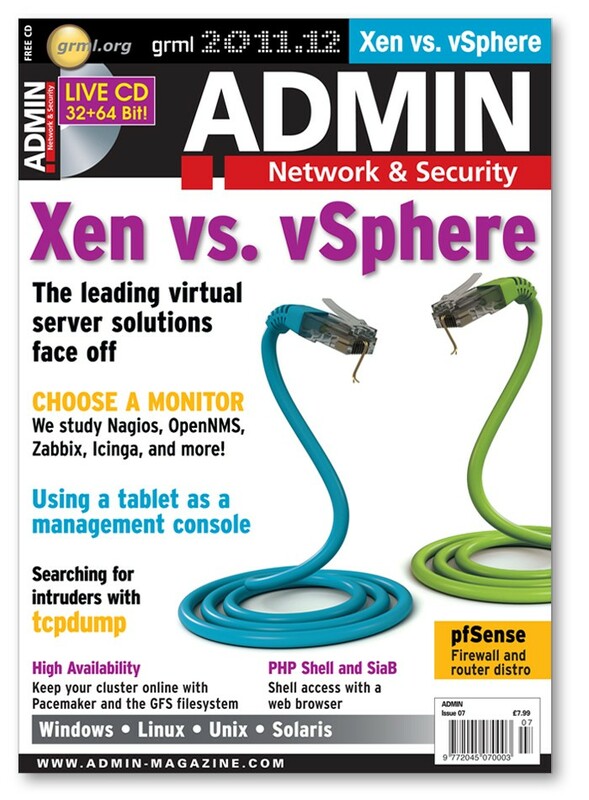 This issue features a face-off between the leading virtual server solutions; a comparison of monitoring software Nagios, OpenNMS, Zabbix, and Icinga; and more! We also take a look at using a tablet computer as a management console. vSphere vs. XenServer – VMware and Citrix battle it out in the virtual server market. Shell in a Browser – When HTTP(S) is all you have, you can still access the shell. pfSense – This specialty distro based on FreeBSD gives you a firewall, a router, and much more in just 100MB. Fedora 16 – The latest Fedora puts the emphasis on virtualization and the cloud. Admin News – Sandia Labs develops DNSViz to help spot DNS vulnerabilities, the US government releases cloud security guidelines, and Check Point announces new security gateways for the cloud. New Products – NVidia gets Best in Show, Lenovo showcases new IdeaPads, and Iomega shows off terabyte network storage. tcpdump – This packet-sniffing security tool will keep your network safe from intruders. Zabbix – The strength of the Zabbix monitoring tool lies with items, triggers, and actions. Upstart – Abandon runlevels and embrace jobs and events with this System V init replacement for Ubuntu-based systems. Tablet Sys Admin – Mobile tablet computers make handy management tools for busy sys admins. Monitoring with Opsview – Opsview teams up with Pacemaker, Heartbeat, and DRBD. Virsch – Virsch doesn’t just query and control VMs, it can be scripted, too. Nagios Benchmarks – We submit Nagios to performance testing and check out some alternatives. Writing Your Own OCF Agent – Manage your cluster with a custom resource agent. GFS – Create a low-budget redundant service with GFS2, DRBD, and Pacemaker. Performance Tuning Dojo – Use RAM to your advantage to reduce latency and even out response time. Monitoring Comparison – We look at OpenNMS, Zabbix, Icinga, and Nagios monitoring solutions. Qemu and the Kernel – Debug Linux on the run with the Qemu emulator. LVM Basics – The Logical Volume Manager lets you resize physical volumes on the fly. Admin Story: Mounting an iPad – Modify standard Linux packages to mount iPads with the latest iOS patch.